As a little election-season fun, see if you can guess what the Electoral College result will be. 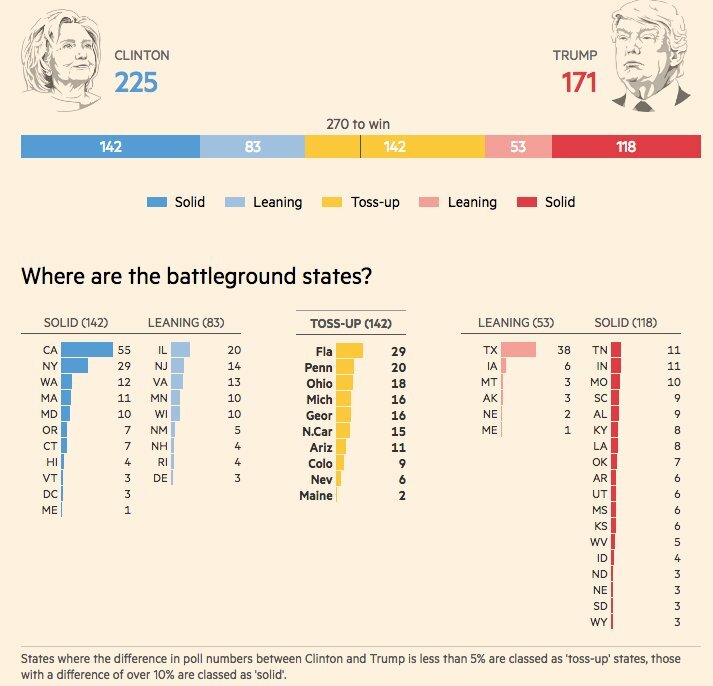 ✔ Winner = Whoever is closest to the actual electoral vote is the winner. ✔ Open to = The contest is open to all registered SI users, but the Editors, Moderators, etc. are not eligible for the prize (only bragging rights). ✔ Prize = $25.00 Amazon Gift card for electoral college. Example: Clinton 290 to Trump 247. Use the helpful 270toWin to model. Pick who will win the Senate. Example: Republicans 52 to Democrats 48. Extra $2.00 added to the winner if correct party guessed. Pick who will win the House. Example: Republicans 234 to Democrats 201. Extra $2.00 added to the winner if correct party guessed. Pick who will win the House seat of your own Congressional district for an extra $1. ✔ Winner potential prize up to $30. ✔ Caveat: Contest must have at least 10 eligible submissions. SI moderator or admin posts will not be counted as an eligible submission. ✔ Multiple submissions permitted, but only your latest revision will be counted. ✔ No electioneering on the contest thread! Senate: 50-50 tie, but vice-president Kaine gives control to Democrats. House district pick: VA_02: Scott Taylor. Sounds like gambling to me! I'm going to hold out hope that Mrs. Clinton gets federal housing in Waseca (women's prison) instead of Washington DC. Assume for a minute that Hillary Clinton will win the Presidency: Democrats will have the same power that they have now in that eventuality. But what happens if they also capture the Senate? [no campaign] money, and all indications are that far more will be raised during the last two months of the campaign, will apparently go to incumbents Mark Kirk of Illinois and Ron Johnson of Wisconsin who have apparently been written off. But roughly $60 Million of it will go into television ads in seven states; Indiana, Missouri, Nevada, New Hampshire, North Carolina, Ohio, and Pennsylvania. Since I have an undergrad degree in Political Science, this is interesting to me. I'll post some numbers in early October. Remember that in the last 6 Presidential elections, Democrats have won the same 18 states and the Dist. of Columbia consistently, giving the Democratic nominee 242 electoral votes, needing only 28 more to win. Republicans have a lot of ground work to do, while Democrats have an easier path to win. Anything can happen in politics. The Libertarian Party may be a wild card this time, although I don't see the Libertarian ticket winning any states. But it would be interesting to see the election placed into the House (President) and Senate (Vice-President). I'll post some numbers in early October. Only your last entry counts! “You know, to just be grossly generalistic, you could put half of Trump’s supporters into what I call the basket of deplorables. Right?” ... “The racist, sexist, homophobic, xenophobic, Islamaphobic—you name it. And unfortunately there are people like that. I might have to redo my picks toward the end, especially if Hillary keeps fainting like she did today and having coughing fits. It would serve us well to remember that when she says “homophobic” — she means someone who believes in traditional marriage between a man and a woman. When she says “racist” — she means someone who believes that cops should be respected, that all lives matter, BLM is a divisive movement and that helping people of color means more than throwing money in their general direction. When she says “misogynist” — she means those who think that a baby has a right to LIFE more than a woman has a right to kill an inconvenient infant. When she says “xenophobic” — she means people that think that borders and immigration laws should be respected. When she says “Islamaphobic” — she means those who think that coddling terrorists who practice a violent religion needs to stop. When she says “Basket of Deplorables” — she means God-fearing people who care about their country, respect traditional values, believe gun-ownership is a Constitutional right and aren’t ashamed to wave an American flag — you know, people like those who don’t protest in the streets, burn down convenience stores, didn’t attend Ivy League indoctrination centers and don’t draw their income from the Federal government. Racist -- a white only person who says someone should not be judged by the color of his skin, but by the content of his character. Sexist -- a man only who treats and talks to women like they are different than men. Homophobic -- a person who believes the Bible is the Word of God, which says that homosexuality is sin and/or that marriage is only between a man and a woman. Xenophobic -- an American white male only who (1) opposes illegal immigration, (2) desires the execution of immigration laws, (3) wants a wall built on the southern border of the United States to aid in stopping illegal immigration, and/or (4) believes certain cultures are superior to others. Islamophobic -- a person who is suspicious of a person with a literal, strict interpretation of the Koran or who thinks that Islam causes terrorism or that Islamic terrorism comes from Muslims. For six months now — and an amazing four times in the last two weeks of August alone — the [The New York Times] has ignored or whitewashed history in trying to explain this fall’s battle for the House. Time and again, almost impressively, the Times has managed to write 1,000-plus-word stories about the struggle for Congress that do not mention either of the two most important words — redistricting and gerrymandering — or that diminish the centrality of the maps with a bizarre, passive shrug that this is just the way it is. The actual history has now been denied so many times, and with such similar language, that it’s hard to conclude it’s not intentional and official Times style. Now, the strategy Rove outlined — called Redistricting Majority Project or REDMAP, for short — performed better than the GOP ever imagined. It explains why Republicans were able to draw state legislative lines so stout that in Ohio, Wisconsin, Michigan and North Carolina they’ve captured supermajorities — or something close — in state legislative chambers despite often losing the popular vote. It helps clarify how Republicans held the U.S. House in 2012, taking the overwhelming majority of seats in states like Ohio (12 of 16), Michigan (9 of 14), Pennsylvania (13 of 18) and North Carolina (10 of 13) where they lost or closely divided the popular vote. And it explains why Hillary Clinton could sweep all four of those swing states this fall without a single congressional seat changing sides. Democrats need to win 30 seats to retake the House. You would be hard-pressed to identify 30 competitive districts. (Indeed, the Times cannot, returning again and again to a Kansas seat where a Democratic challenger apparently trails by at least 15 points and hundreds of thousands of dollars. Also, again and again, the Times suggests Trump has made Florida Rep. John Mica vulnerable, ignoring that he’s actually vulnerable because a court forced his district to be redrawn.) There’s a lack of competitive seats because of the way the lines were drawn in 2011. This, too, was part of the GOP plan. Citigroup: "A 35 percent probability for a Trump victory"
"A 35 percent probability for a Trump victory is more meaningful than investors may be appreciating," the team, led by Chief Global Political Analyst Tina Fordham, writes in a note published on Tuesday. "Political probabilities are not like blackjack — there is only one roll of the dice, and 35 percent probability events happen frequently in real life." While Trump has defied expectations this election season, the Clinton campaign has suffered a few perceived mishaps that could tip the balance. Moreover, there are a number of cards in play that could cause Clinton to have a poor performance on election day. The Citi analysts cite low turnout for the Democratic party as enthusiasm wanes, an unforeseen event such as a terrorist attack, or a health incident that causes a withdrawal from the election, as key risks. Next year’s Senate will include at least 44 Republicans: 30 who are not up for re-election this fall, and 14 who face only nominal challengers. On the other side of the aisle will be at least 45 Democrats: 36 who are not up for re-election, and nine who face only nominal opposition. That leaves 11 seats up for grabs. Democrats now hold one of these: Nevada. Republicans hold 10: Arizona, Florida, Illinois, Indiana, Missouri, New Hampshire, North Carolina, Ohio, Pennsylvania and Wisconsin. For the GOP this isn’t all friendly territory: Seven of these 11 states went for President Obama twice. Democrats believe that their best chances to knock off Republican incumbents are Illinois and Wisconsin. In the former, Republican Sen. Mark Kirk won his deep-blue state in 2010 by only 1.6 percentage points. Mr. Kirk is running an aggressive campaign, while his opponent, Rep. Tammy Duckworth, has yet to unite Democrats. Still, he has his work cut out for him. In Wisconsin, Republican Sen.Ron Johnson faces an attempted comeback by the man he defeated six years ago, former Sen. Russ Feingold. Mr. Johnson trails, but tenacious campaigning has brought him to within 3 points, according to a Marquette University poll from late August. In Florida and Indiana, Democrats had hoped to easily claim open Republican seats. The Sunshine State’s Sen. Marco Rubio had opted to run for president instead of re-election. But at the last minute Mr. Rubio re-entered the race. Then his opponent, Democratic Rep.Patrick Murphy, had his claimed resume challenged by a Miami TV news report. Mr. Rubio now leads by 5.4 points. In Indiana the Democrat, former Sen. Evan Bayh, is up by a similar margin. Mr. Bayh retired six years ago, but Democrats substituted him for their lackluster nominee in July. Voters have since soured after learning that Mr. Bayh hasn’t lived in Indiana since retiring. Republicans picked a superb candidate in Rep. Todd Young, a Naval Academy grad and Marine, who is hitting Mr. Bayh for supporting ObamaCare, the stimulus and cap-and-trade. As a result, Democrats are moving money into Missouri, North Carolina and Nevada. The Show-Me State’s Republican Sen. Roy Blunt, a leader on veterans’ issues, is up by 4.8 points. He faces Secretary of State Jason Kander, a supporter of ObamaCare and a national energy tax who was given an “F” rating from the NRA. In North Carolina, Republican Sen. Richard Burr leads by 3.3 points. He faces a former state director of the ACLU, Deborah Ross, who defended flag burning while refusing to aid a veteran seeking to overturn his condo association’s rule against flag displays. She also sought to ban Christmas songs from elementary schools. That might play better in Vermont. Nate Silver today says 63% chance of Clinton win! an indictment against our culture, that the populist approach (i.e. Trumpism) holds so much appeal. ....on why Drumpf is doing so well is that some people are becoming painfully aware of what a crook Hilliary is, and another large group is painfully aware that promises from both parties aren't worth squat. The first group (of which I'm a part) sees huge risks with Drumpf, but even bigger ones with Hilliary. The latter group wants, in the words of a friend of mine, someone to come in and blow up the place, figuratively speaking. Really, if you're a tradesman or low skilled worker trying to make a go of it, and you've competing with illegal immigrant labor while DHS doesn't do its legal duty, and you've watched both Democrats and establishment Republicans allow DHS to do this, what is your response going to be? It's going to be something like "we've tried the respectable candidates, and this is what we get. So it's Trump and...<string of expletives>". As of now, we list just four races as toss-ups: Indiana, Nevada, New Hampshire and Pennsylvania. 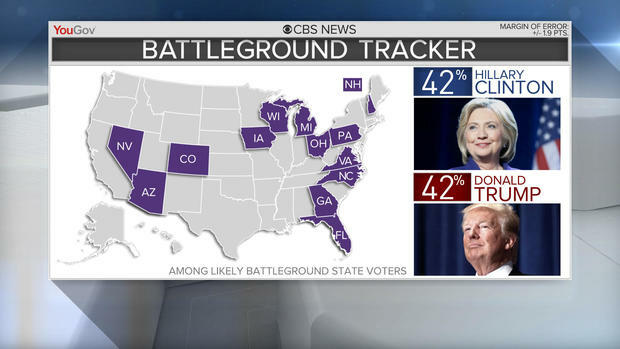 Given Republicans currently have an effective 54-46 majority, Democrats would have to win three of those four toss-ups if Hillary Clinton wins the presidency -- Vice President Kaine would be the tie-breaker in a 50-50 Senate -- and all four if Trump wins the presidency. Professor Allan Lichtman says Trump win! American University Professor Allan Lichtman has accurately predicted every presidential election for 30 years. This year he predicts Donald Trump will win. Many of his comments and analyses are particularly relevant to today's political climate in America. Note: I am not a political Libertarian, but the book is excellent. Wally, The Road to Serfdom is indeed excellent. Thanks for posting the PDF. I love the dedication, "To the socialists of all parties." For the first time since I began voting in Presidential elections (the first was 1976), I am not sure whether to vote for any Presidential candidate. Certainly not voting for Clinton or Stein. The Libertarian candidate, Johnson, is economically appealing but militarily and socially dangerous. The debate last night demonstrated how easily Trump can be manipulated by someone who knows his weaknesses. The Clinton campaign knew what he would say and had "one-liners" ready. He didn't give me the impression of someone suitable for the Presidency. The "lesser of two evils" argument, which many use to justify voting for Trump, does have some merit, but it isn't enough. If our choices were the devil and Hitler, would we vote for Hitler? (I am not comparing Trump to Hitler; just an illustration). Just because our political system gives us some choices doesn't mean that we HAVE to vote for one of those choices. I may decide to vote for Trump, but what I saw last night doesn't motivate me to vote for him just to keep Clinton from being elected. 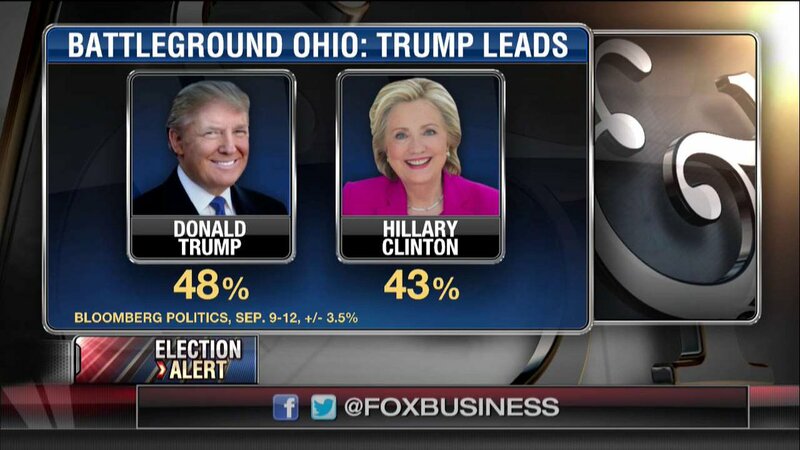 If Trump wants to win, he must do better in the next 2 debates, or Clinton will be the next President. ....I don't like Trump, but there is one huge advantage; he does not have 34 Senators who, come Hell or high water, will vote to keep him in the Presidency no matter what he does. Hilliary does, as the disgraceful conduct of Democrats in 1998 and for the past seven years demonstrates.